Every month Book of Yum hosts Adopt a Gluten Free Blogger. You’re supposed to make one of the recipes of whomever you adopt and then share a post on your adventure on the first of the month. This month I adopted Blog Schmog (aka glutenfree4goofs) and my adventures in getting to write this was nothing compared to what Jess went through to make these Rock Day Taquitos. More on my adventures later, first on to the taquitos. I’ve always loved taquitos and the fact that these are gluten free and dairy free was a bonus! I could never do Jess’s story justice so I insist you go to her post and find out what took place with, as she calls them, Thing 1 and Thing 2, the day she was making taquitos. Needless to say, my recipe went much smoother. However, I did underestimate how long it would take to roll 50 taquitos. To make it easier I did use store bought corn tortillas. I thought about making my own but I didn’t have time for that the evening I made these. Instead I used organic sprouted corn tortillias. They work well if you let them thaw slowly. I find mine in the freezer section of Whole Foods. Jess left room for interpretation on how I would season the chicken meat for the taquitos. Some I made very mild for my 15 year old picky eater. Didn’t matter, he wouldn’t eat them anyway. The rest I added a little more spice, but hubby said it wasn’t spicy enough however they tasted really good. Man, I just couldn’t please anyone that night. I however thought they ALL were delicious. Here they are all rolled up and waiting to be placed into the frying pan to be crisped up. Like Jess promised, they didn’t unroll because they were all snug in the pan. The only problem I see is trying not to eat them as you pull them out of the pan. 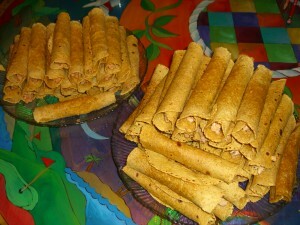 When I served them I added salsa and refried beans on the table to put on our plated and dip the taquitos into. I now have 2 big bags of frozen taquitos ready to eat at a moment’s notice (minute meal), like Tuesday for Cinco de Mayo! I’m so glad I made this. It really was not a lot of work with the meat being cooked in the crockpot at it’s leisure. I think I’ll make a batch with refried pinto or black beans for my vegetarian son who will be home from college for the summer soon. So if you are looking for a great food for your celebration on Tuesday, or even a meal that will take just a few minutes to reheat during a busy week, try these. Make your batch and do leave out the rocks. Thank you to Book of Yum for hosting Adopt a Gluten Free Blogger. Beee-U-tee-ful! Thanks for trying them and I agree it's impossible not to try a few! Cute post. Jessie- I have to admit, I tried more than just one. It was more like 6 for the plate 1 for me, 6 for the plate, 1 for me and that's the evening went. Thanks for sharing the recipe. Jessie is a sweetie … thanks for the reminder that I need to check out her site again.